Instructions and helpful hints for using our calligraphic and bookbinding supplies. Please check back here periodically, we will be adding to this page as frequently as practical. I'm addressing invitations, but these envelopes are hard to work with. Help! For lined white or light colored envelopes, you can draw guidelines with pencil and then erase with a white plastic eraser. Test to make sure that the erasing is not noticeable, that it is not affecting the envelope or your letters. --Disappearing ink pens for fabric can be used. The lines don’t always disappear, so test out a sample first. Use the fine point for paper. The medium point for fabric. --A soapstone pencil can be used for dark paper. Sharpen the pencil in a good hand pencil sharpener to a fine point. The lines can be brushed off after writing. --A Phantom Liner (Reflections) is a good tool if you have one. They are no longer made. Some people like them a lot and use them often. Others bought them and found them useless, so you might ask around in your guild. Click here to see an instructional PDF file on how to adjust your oblique holder. I have the Ames Lettering Guide, but do not have a clue how to use it. Do you have instructions? I have an antique penholder. It is very slim and would need a tiny nib. What nibs might work? The Brause 66EF and the Brause 513 have the smallest bases (the part that fits into the holder). The arc is only 1/8” across from one end of the arc to the other. Hunt 103, 100; Gillott 290, 291; and Hiro 700 are approximately 3/8”, measuring from one end of the arc to the other. My Blackwell holder won’t hold the smallest nibs tightly such as Brause 66EF or crowquills (tubular nibs). The screw does not keep them in place. If the holder works fine for larger nibs such as the Gillott 304 or 404, then you most likely just need a longer screw. Initially these holders used a short screw that did not work well with these smallest of nibs. Holders now are supposed to come with a longer screw. So you may have an older holder or your newer one came with a too-short screw by mistake. Request a longer screw and we will mail one to you. There is no charge. I have been using one of your excellent practice pads (P21, P01) and have some lettering that I would like to reproduce. How can I get rid of the light blue grid lines? The low tech solution is to use a copier. Make a copy on the machine and see how much of the grid is visible. If the grid is visible, lighten the exposure a few percent and make another copy. Repeat until the grid is no longer visible. Is your bookbinding thread 100% Flax? Our LINEN bookbinding thread is 100% Linen / 100% Flax. Linen and Flax are two words for the same item, thread or fabric made from the flax plant. Because of this strength linen thread is used to sew signatures in bookbinding. It is often lightly waxed with Beeswax (S289). 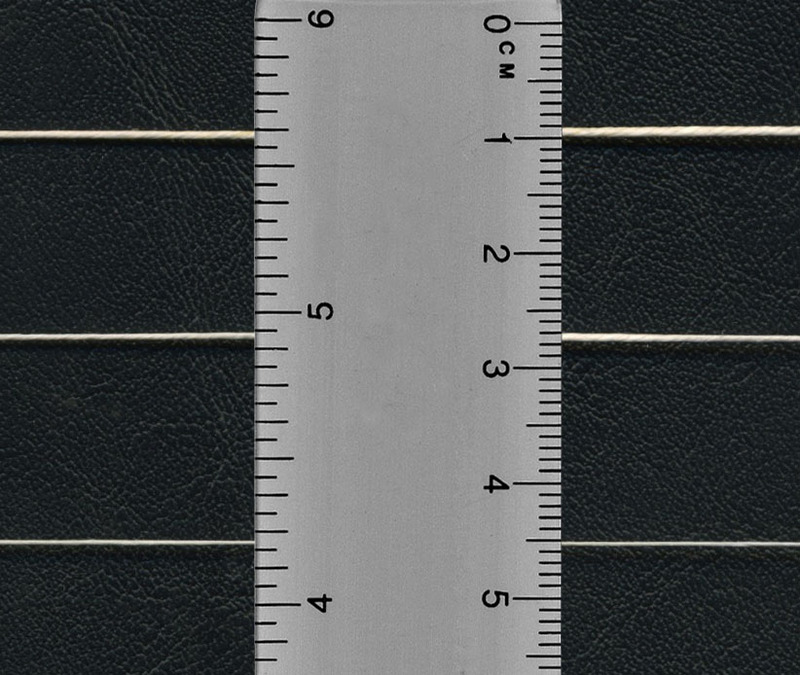 The first number is the thickness of the thread. The higher the number, the thinner the thread. That is 12/3 is thicker than 18/3. The second number of strands that are twisted together to make the thread. 12/3 has three strands. Linen thread is made from the fibers of the flax plant. Linen thread is sometimes referred to as Flax thread or Flaxen thread. All of these answers refer to calligraphy ink for dip pens. What is the best calligraphy ink for beginners? The best dip pen calligraphy ink for copperplate and broad-edged calligraphy for beginners is Higgins Eternal. It is non-waterproof and easy to clean out of your pen. The best calligraphy ink for beginner’s copperplate and italic calligraphy classes is Higgins Eternal. It is inexpensive. It is non-waterproof and easy for students to clean out of their pens. It does not build up on their pens like Sumi Ink, so they do not have to clean their pen as often while they are practicing and they can concentrate on their letterforms. What is the best ink for copperplate and Spencerian script? Many professional calligraphers/penmen continue to use Higgins Eternal. Our three most popular inks for pointed pen alphabets are Moon Palace Sumi, McCaffrey's Penmans Ink, and Higgins Eternal. Moon Palace Sumi is densely black and water-resistant and gives good hairlines. McCaffrey's is a traditional gall ink and gives very fine hairlines and is available in a variety of colors. What is the most popular ink for Spencerian? What is the most popular ink for Copperplate? What is the best gold ink for calligraphy? Dr. Martin's Iridescent Copperplate Gold is our most popular metallic gold ink for broad-edged calligraphy (Italic, blackletter, etc.) or copperplate/Spencerian script. It is an acrylic ink and dries waterproof. I see so many calligraphy markers, how do I choose the one that's best for my project? We have prepared this chart to make picking a marker easy. The chart is sorted by Product Number, Waterproof/Non-waterproof, lightfast/non-lightfast, nib size. When and how do I refill my Copic Markers? When you see streaking in your work, it is time to refill your marker. 1. Match the color number of your marker with the color number on the Copic Various Ink Cap (M73. Copic Marker Refill). 2. Always work over a protected surface or paper plate. Hold the marker in one hand, at a slightly tilted angle. 3. With the other hand gently dab 30-40 drops onto the nib surface. Allow each drop to be absorbed before adding the next. 30-40 drops will recharge your marker for a while. Wide markers have a built-in notch at the base of the nib that the ink dropper fits into for refilling. 4. Try not to overfill. Use a tissue to absorb the extra ink. Use rubbing alcohol to clean any ink spills or to wipe your marker clean. You can rinse dirty caps in alcohol and wipe the insides clean with a cotton swab. How do I replace the cartridge in a Copic Multiliner SP? First, make sure that you are working with the Multiliner SP. It has an aluminum barrel. ---Type A refills are only for the ultra fine line pens: .03 mm, .05 mm, and 0.1 mm. ---Type B refills are for all other Multiliner SP pens: 0.2 mm, 0.25 mm, 0.3 mm, 0.35 mm, 0.5 mm, 0.7 mm, or Brush nibs. Then follow the instructions on this sheet to correctly replace the cartridge. What is the best ink for Copperplate? Betty Gilpin of Nashville likes Best Bottle Sumi (I43). She can use it straight out of the bottle without having to dilute it. She gets a better contrast between the thicks and thins than with other Sumi inks. With Best Bottle her thin strokes are fine and stay fine. (She finds that if the thin strokes start thickening up during a job it often means that the ink has dried on her pen and she needs to rinse it off.) She finds that Moon Palace (I70) builds up on the pen quicker and requires more pen rinsing. She uses a Gillott 303. What holders do left-handers use for copperplate and Spencerian? Most left-handed penmen (and penwomen) use a regular straight penholder for Copperplate and Spencerian. A few lefthanders use the oblique holder. Almost all right-handers use an oblique holder (a straight holder with either a metal flange or plastic structure attached to the end that holds the nib). A few right-handers use a straight holder. How do I use Crystal Lacquer in my lettering? Use the instruction sheets for Crystal Lacquer. How can I use Dr. Martin's Spectralite Ink to finally get the gold or copper color that I need? All of the various inks and gouaches are different shades and I am having trouble finding the exact shade I need. I'm confused about the metric weighting system of your papers. How do I find the weight I'm looking for? Use the Paper Comparison Chart to get a rough weight comparison between papers. Can I use the spay fixative you offer on a watercolor painting and then write on top of the painting? The spray fixative should “fix” the watercolor so that the ink does not mix with the watercolor or the watercolor with the ink. However, it is very important that you do a test first to make sure there will be no problems with the final project. It is best to spray the fixative using one or more light coats rather than one heavy one. You may find that acrylic inks work best on top of the fixative. ALWAYS use spray fixative in a well ventilated area. What cartridges work in which fountain pens? View this photo of our cartridges for a comparison. Shaeffer Pens have a long cartridge. You should buy their cartridges for their pen. Manuscript and Rotring use short cartridges. They are likely interchangeable. Lamy Cartridges are longer than the Sheaffer cartridges and are shaped differently. Online Pens use short cartridges. The Manuscript cartridges fit in the Online pen. Pilot Parallel Pen cartridges have a unique size and shape. How do I insert the cartridge into a long-staff Brause Calligraphy Pen? 2. Insert the cartridge into the nib unit to piece the cartridge. Insert the "pointed" end, not the flat end but the end with the smaller cylindrical tip. 3. Press firmly and you will feel the cartridge being pierced. Screw the barrel onto the pen. a. If you have a very light hand, try adding slightly more pressure. If you already write with some pressure, do not add more pressure. The Brause Calligraphy Pen takes standard small European Cartridges. The Manuscript cartridges (FP91, FP91-30) and Pelikan cartridges (FP115) will work in this pen. (Speedball, Lamy, and Pilot cartridges will not work.) Brause does NOT make a converter (for using bottled ink) for this pen. What is the best fountain pen ink? Pelikan 4001 is our recommendation for the best fountain pen ink. Herbin Ink is a fountain pen ink in a delightful array of colors. You can often match the ink color of the return address on wedding invitations with Herbin Ink. Is there waterproof fountain pen ink? Calli Ink is a pigmented, acrylic based waterproof fountain pen ink. You should rinse out your pen before filling it with Calli ink. Do not store Calli Ink in your pen if you do not use your pen frequently. We at John Neal, Bookseller do not recommend Calli Ink for expensive or vintage fountain pens. While Calli works very well in fountain pens, it dries waterproof and can potentially ruin a pen. Is there pigmented fountain pen ink? Winsor Newton Calligraphy Inks are non-waterproof, pigmented inks for fountain pens. (Only the blue capped bottles are for fountain pens. Use the metallic gold & silver and the matte black with the red cap for dip pen and brush only.) Calli Ink is a pigmented, acrylic based waterproof fountain pen ink. You should rinse out your pen before filling it with Calli ink. Do not store Calli Ink in your pen if you do not use your pen frequently. We at John Neal, Bookseller do not recommend Calli Ink for expensive or vintage fountain pens. While Calli works very well in fountain pens, it dries waterproof and can potentially ruin a pen. Is there an archival ink for my fountain pen? If the piece is going on the wall, you need a light-fast ink which generally means a pigmented ink. Pigmented black ink is lightfast. Most fountain pen inks such as Pelikan 4001 and Herbin are dye based inks and are not light-fast and are not suitable for work that is meant to last on display for decades. What is your recommendation for a densely black fountain pen ink that has good coverage and is lightfast? For lightfastness, you need pigmented ink. The pigmented fountain pen inks we carry are Winsor & Newton Calligraphy Ink (blue cap only) and Calli. If you need waterproof, Calli is the best (but don't store it in a pen that you don't use regularly). If non-waterproof is okay, then Winsor & Newton Calligraphy Ink. Do not put any ink in your fountain pen that does not say “for fountain pen” on the bottle. Inks for technical pens are not necessarily suitable for fountain pens. How do I use gouache for calligraphy? I have a tube of gouache that has dried up. Can I still use it? Winsor & Newton has discontinued some of their gouache colors and added some new colors. How can I find out which colors have changed, which have been discontinued, and which are new? Do you have a color chart for Winsor & Newton gouache? Which Winsor & Newton white gouache do I need? Zinc White has always been recommended for color mixing. It has a lower tinting strength. Which Winsor & Newton black gouache do I need? All the blacks are a dense black for calligraphy. Ivory Black and Jet Black are generally recommended. Ivory Black is less opaque with lower tinting strength and makes brown (warm) greys and sepia tones when mixed with white. Jet Black is a rich, deep, opaque black which makes blue greys when mixed with white. Lamp Black is a less opaque black of lower tinting strength, giving paler, blue (cool) greys when mixed with white. What is the best way to prepare gum ammoniac? Insert the nib between one of the four metal prongs and the outer metal ring. If the nib is large such as a Mitchell, first try inserting the nib with one edge of the nib in the gap in the metal ring. Other nibs may not be picky as to placement along the ring. 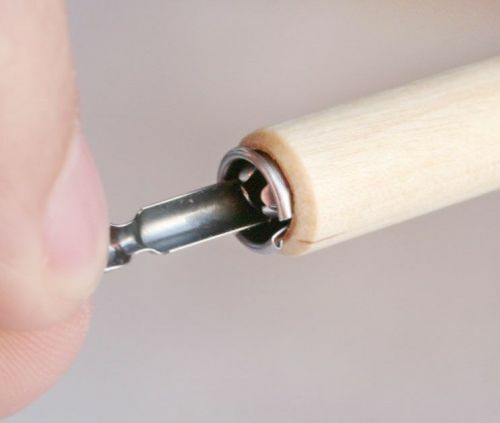 If the metal ring unit pulls out when you try to remove the nib, it is easy to re-insert the ring unit in the holder. Do NOT insert the nib in the gap around the tips of the prongs. See the following images as examples. Do you have any information about Hunt pointed pen nibs? This chart of Hunt pointed pen nibs gives names, illustrations, and descriptions for all of the Hunt pointed nibs that we carry. I would like an India ink that I can use in my fountain pen; what do you recommend? Traditional India Ink has shellac as a binder and is NOT suitable for fountain pens. There are now black pigmented inks for fountain pens. Winsor & Newton Calligraphy Ink (Blue Cap, NOT the matte black with the red cap) is pigmented and works in Fountain Pens. Calli Ink is also designed for fountain pens. It works well. You should not store your pen with this ink as it dries waterproof and could ruin your pen. If you use your pen every day, there should be no problem. (Store your pen flat when not in use.) I don’t recommend Calli for use in expensive, fancy fountain pens. Use it in your utilitarian models. These inks are designed for Calligraphy Fountain Pens. They might not work with fine tipped fountain pens and most likely won’t work in regular fountain pens that regular (dye-based) ink does not flow out well. How do I write on shiny surfaces? My ink sits on the surface and beads up. For flat paper try writing with Sumi Ink. It is less likely to bead. Where adhesion is a concern try writing with Acrylic inks such as FW Acrylic Artists Ink or Ziller Inks. Acrylic inks will adhere better to slick, non-absorbent surfaces better than other inks. They also bead less. If the ink still beads up, add a wetting agent to your ink: (I don't have any direct experience with either of the two products that are still available. Test with a small amount of ink, not a large bottle.) These wetting agents should work. (Dish detergent may work in a pinch. You need VERY little! ) All decrease the surface tension causing the ink to flatten out. You may have problems getting thin thins when using a wetting agent. Pounce is sometimes used to abrade the surface slightly. You get rid of the gloss and the ink acts more like ink. But you do change the appearance of the surface which may or may not be suitable. How do I use instacoll? First, lay the Instacoll. Because Instacoll is an acrylic base, it has a high surface tension which means it is somewhat “slimy” and flows much better from a brush than a pen. After you have laid the Instacoll, let it dry approx ½ hour. Please note that how long the base should dry before you gild on it, varies depending on two factors: how thick you laid the base and how humid the room is. The loose rule of thumb is that you can lay the gold as soon as the base is tacky. It does not have to “set up” hard or dry completely. If you wait too long, the gold does not adhere. Now you are ready to lay your patent gold leaf. Use your finger as a burnisher and put two layers of gold on the base. Use a cotton ball or silk cloth to burnish the gold and then remove the excess. Instacoll is also commonly used in architectural applications of leafing. When used for a large area the “base” must be reactivated in order for the leaf to adhere (because the “base” will dry completely before the leaf is adhered). Because our customers use it for small applications there is no need to reactivate the “base”. Therefore you should ignore the label directly on the bottle that states this is “component 1 of 2”. These inks work very well with a dip pen: chisel-edged or pointed nib. The bottle will come with a light color solid on the bottom and a darker liquid. The color of the ink is between these two. You need to thoroughly mix the ink in the bottle before you use it. Try stirring, or stirring and shaking. If you shake, you will get bubbles. If the bubbles cause problems, let them dissipate and then just stir. To keep the “iridescence” from settling out while you are working, give the ink an occasional stir. The ink dries waterproof. To keep the ink from drying and building up on your nib, give the nib an occasional rinse and dry while you work. All metallic, pearlescent, iridescent inks require some more effort to use than the black ink you use all the time. What is a Kemper Fluid Writer or Kemper Tool (S772) used for? What are the terms and conditions for use of your Linda Schneider stamps? I would like to know the copyright conditions: how it can be used, whether it can be stamped on products that will themselves be further sold or not, and related uses? 1) Each item must be hand stamped. Mechanical reproductions are not acceptable. 2) The back of the card must contain typed, stamped, or hand-written copyright information. Please refer to the label index on the side of the image you are using for the correct copyright information. It is not necessary to include the copyright date. But be sure to include the copyright information for each stamp you are using. This information needs to be listed only once for each artist, no matter how many images are used by that artist. For instance, if you use three images that are copyright LINDA SCHNEIDER, you need to only list the copyright information © Linda Schneider one time on the back of the item. How do I replace the lamp in my Logan Light Pad? Locate six small Phillips screws in the back of the housing. Remove the screws and set aside. Locate six tabs along the edge of the rear of the housing to remove the outer, front frame. Using a small, blunt object, push the tabs toward the center of the housing to release them. The front frame can now be removed. The bulbs are located under silver tape along two of the edges of the housing. Gently pry up the silver tape that covers the bulbs. Locate a grey cap on each end of the bulb. This is the end of the bulb. Remove the grey caps from the housing. Locate two white plugs, one for each bulb. Gently pry the bulb’s plug from the plug on the board. The bulb can now be removed. Install the new bulb and reassemble the housing. I would like to see a picture of the nibs available in the Manuscript Cartridge Pen sets. We have a pdf file which shows the available nibs. I'm having trouble getting my Manuscript fountain pen to write. What do I do? 1. If are used to writing with a Pilot Parallel Pen, you should not expect a similar flow from the Manuscript Pen in the larger sizes. 2. The back of the box of the Deluxe Set has a diagram showing how to load the pen. You use two cartridges with the flat sides next to each other. Push the writing cartridge into the nib unit (no need to puncture the cartridge). Put the other cartridge in the barrel with the small end down in the barrel. 3. Screw the nib unit and the barrel together to puncture the writing cartridge. 4. Hold the pen fully vertical with the nib down. Give it a couple of shakes to help gravity get the ink into the nib. 5. Start writing. You will need to apply a SLIGHT pressure. You may need to start writing back and forth with a thin stroke. The ink in my Manuscript Fountain Pen does not flow well. What do I do? 1. Most of the time the problem is that the ink has dried in the nib, blocking or partially blocking the ink flow. Take a moist cloth or paper towel and wipe the top surface of the pen nib. If that does not clear the blockage, you can try soaking the nib section of the pen in a weak ammonia solution (blue colored window cleaner has ammonia in it), or you could try using an ultrasonic cleaner. 2. Make sure you have the entire edge of the pen on the paper. 3. Try the pen on a different paper and/or with a cushion of extra sheets under the writing paper. 4. If you are using bottle ink, make sure the bottle says it is for FOUNTAIN pens. Some inks which work fine in technical pens will clog your fountain pen. If waterproof ink has dried in your pen, it might be saved with an ultrasonic cleaner. 5. Pigment-based fountain pen inks (Calli & Winsor Newton Calligraphy (Blue Cap)) may cause more flow problems than dye-based inks such as the cartridges that came with the pen and Pelikan 4001. 6. If your pen writes well for some of the page but skips only in certain areas of the paper, you may need to use a protective sheet under your writing hand. Oils or moisture from your hand can cause problems. Usually oil will cause skipping; moisture will cause bleeding. A sheet of plain paper should work fine to protect your writing surface. I've tried Winsor & Newton, Daler-Rowney, Schminke, Pebeo and the Masquepen. They each have their pluses and minuses. The Daler-Rowney is thick and has a slightly yellowish tint to it, so it sometimes leaves a trace of that on the paper when you remove it. The Masquepen is bluish, you can see it easily on the paper, and it removes clean. The Pebeo has a nice viscosity for writing. Some applications are better done with a specific brand. I like to use the Pebeo brand when I want to write with masking fluid because it just seems to flow better. I like to use Mitchell nibs without the reservoir, but any nib that doesn't have a built in reservoir can be used. Just dip and write in your usual way. Be sure to allow the masking fluid to dry completely before you paint or write over it. The Masquepen has a very useful applicator. I used it recently on a watercolor painting to add tiny branches on trees that I wanted to remain white, as well as to block out some fence posts. The applicator is monoline in character, and you might try writing with it. There is an adaptor for the Masquepen that will make even thinner lines. I especially like the fluid’s light blue color, which makes it easy to see as you paint. The refills are a little pricey but go a long way. I love just playing with the Masquepen. For the record, I most often work on 300# paper when I want to work wet which saves a lot of time stretching paper. Some people refill the Masquepen with Pebeo (which the manufacturer labels as “Drawing Gum”). You can use a brush or a pen; the Masquepen has an applicator. When I use a brush, I have a small (hotel size) bar of soap and some water near my work area. Dip your brush in water and work/roll it on the bar of soap BEFORE you dip the brush in the masking fluid. Repeat the process anytime you rinse your brush. The object is to lubricate the bristles and keep the rubber on the surface so it rinses off easily. Try to keep the fluid off of the ferrule (where the hairs meet the handle), and your clean-up will be minimal. I always try to use an older brush just in case. But I've occasionally used my good red sables (accidentally), and they've cleaned up nicely. This works for all the brands. It's really important that the masking fluid is COMPLETELY dry before you paint over it or try to remove it. Also, I wouldn't suggest leaving your artwork in a warm place (like a sunny window) or using a hairdryer on too high a setting if you use one to speed the drying. Too much heat can make removal very difficult, if not impossible. Too much heat may also cause the masking fluid to stain your paper. Likewise, if the masking fluid (and what you painted over it with) isn't completely dry, you will damage the surface of the paper when you remove it. When the masking fluid is completely dry, you can remove it by simply rubbing your clean fingers over it lightly, or remove it more easily with a rubber cement pick-up. I have some questions about using and caring for McCaffery's ink. Can you give me any more information? Consult this pdf file (https://www.johnnealbooks.com/downloads/mccafferysink.pdf) to discover Michael Sull's suggestions and information on using McCaffery's Penman's Ink. I'm having trouble with my McCaffrey's ink - it forms mold on the surface in a day. It is all the colors of McCaffrey’s. At present I just skim it off and use the ink, then next time I open it, even as soon as a day later, there is more mold. Is there anything I can do to prevent that? It happens from time to time. It may happen more when the ink is used right out of the bottle. The colors are from natural ingredients and sometimes mold will get started. The open bottle invites any mold floating in the air to land in it and take off. For the last 2 or 3 years I have been adding a tea tree oil solution which acts as a natural antiseptic to help control it (available in health food stores); before I used potassium metabisulfate which is used in wine to control mold (available in wine/beer supply stores). But sometimes even that does not help because of the environment that it is being used in. You can add some of either one of these items to see if that helps. I think that in warmer climates (whether it is a winter heated house or a summer one without air conditioning) it is probably worse. I love the effect of McCaffrey’s Glossy Black, but it is not drying on the envelopes. The hand he uses for envelopes has wide strokes on the capitals. He does not find that the Glossy ink ever dries on those strokes within a practical length of time. Even after the ink was dry, stacked envelopes could offset. The fine strokes on the capitals and the lowercase letters are not generally a problem, so if you write with less stress on the strokes, you may not have experienced a problem. While John loves the appearance of the Glossy Black, he does not find the ink suitable for his envelope work. John now uses the McCaffreys Penmans Ink for this. The regular Penman’s ink dries quickly and does not have problems with offset when the envelopes are stacked. John has found if you thin the Glossy Ink with water, you will have less of a problem with slow drying and offset onto other envelopes. So if you don’t use heavily stressed capitals, this may be a workable solution. He has also heard of penmen who have mixed the regular and the glossy. You get some shine and better drying. If you end up with a job with Glossy Black that is sticking, John had success with getting some offset powder from his printer. He rubbed a bit across the letters and tapped the envelope on the desk to remove the excess powder. The shine was cut a bit, but the envelopes did not stick to each other. He has not tried Microglaze, but it might be a solution. He uses Microglaze for non-waterproof inks. You just rub it over the lettering with your finger. How do I use Kolner Miniatum? Apply Miniatum directly to smooth paper (or vellum) with brush or pen. The smoother your paper, the more mirror-like the finish to the gilding. (If you work on textured paper, the texture of the paper may follow into the gilding.) Miniatum will provide the best results when the size forms a slightly elevated bead on the surface. The minimum drying time is 3-5 hours depending on the thickness of the layer of Miniatum, the temperature, and the humidity. (Composition Metals require a shorter drying time.) The material remains open for gilding for the next 20 hours. You may find that you get a better finish with overnight drying. Apply patent leaf by simply laying the leaf on the surface and rubbing the paper backing with a cotton ball. After you have finished applying the gold, press over the surface of the gold with a cotton ball to make sure you have good contact. Burnish with a new cotton ball, one direction only. Loose leaf gold can also be used. Use the tissue from the books to protect the gold leaf when rubbing onto the Miniatum. Once the Miniatum has passed its open window, gold will not adhere to it. You can also reference Reggie’s instructions for Instacoll, a similar product by the same manufacturer. He recommends a much shorter drying time for that product. Do you have pens and nibs for music: to create the staff and to write the notes? For the staff, the Automatic 5 Line Pen is the best tool. It is a dip pen with five points: N28. Automatic 5 Line Pen. Brause makes a Music Nib, (N39. Brause 5 Line Music Nib) but it is much trickier to use. It is less expensive, but you will be much happier with the 5-Line Automatic Pen. For writing the notes, you have a \choice of a fountain pen or a dip pen. 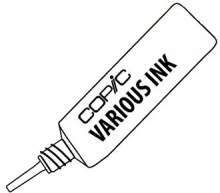 For the FOUNTAIN PEN you will need to nib, barrel and ink (bottle or cartridge). For a DIP PEN you will need a nib, holder & bottle ink. The Mitchell is more flexible than the Brause, and may be more suitable. Music nibs traditionally have some flexibility. Most holders work with these nibs. Our H62. Mahogany Pen Holder is very popular. The bottle inks above will work with dip pens. Since the problem is worse after you pause to reflect, I‘m guessing that the ink is drying on your pen. If the ink has dried on your pen, it won’t necessarily flow well even if you re-dip. This is especially true of waterproof/water-resistant inks such as traditional India ink, Sumi ink or the new waterproof acrylic inks. This should be less of a problem with non-waterproof inks such as Higgins Eternal or the Winsor & Newton Calligraphy inks. Instead of wiping your pen with a moistened paper towel, rinse the nib off in a jar of water and dry with a soft, lint-free rag. (A paper towel will probably work just as well.) Then dip and draw. This cleaning routine can become part of your pauses for reflection. Some Windex in your water (or a bit of ammonia) will be helpful for India ink, Sumi and especially the acrylic inks. At some point the nib will stop working well, even with the regular cleaning. Michael Sull finds that the useful life of nibs can be extended by cleaning the nib with an Ultrasonic Cleaner (S759, $80) which will remove ink dried in the slit of the pen (even waterproof inks) and dried paint from your brushes. If the tip has worn, most people just replace the nib. I have read about Hunt 22B nibs, but can only find Hunt 22 nibs. What gives? For some reason the company that makes these nibs lists them as Hunt 22B in their catalog. That is also s how they are listed in the current version of the JNB printed catalog. However, both new nibs and the older “vintage” ones have this stamped on the nib: “HUNT EXTRA FINE 22”. There is no B. You can call them Hunt 22B or Hunt 22, they are the same nib. When I tried to use a bottle of Old World Ink again after it set on the shelf for around eight months, it was watery on the top and thick (like gouache or acrylic paint straight from the tube) on the bottom. What should I do? With normal use the ink usually does not settle, but under some circumstances it can settle if left undisturbed for a long time. Everything is water soluble, so stirring with a coffee stick, and then shaking the jar (with the cap tightly sealed), should put it right back to normal. After this if the ink is too thick, you can add distilled water to suit your needs. How do I know which pointed pens will work with my holder? Consult the charts below to see which holders and nibs work well together. H23. Hunt (Speedball) Plastic Oblique Pen Holder. Black, hourglass shape. *These are particularly small nibs. Other nibs are the wrong shape and won’t fit in the holder such as the tubular crow quills (Gillott 659, Hunt 108, Hunt 102, Brause 515) or ones with the wrong curve such as the EF Principal. Others fit in but are too loose in the holder and slip out. H69. Hunt (Speedball) Straight Plastic Pen Holder. Black, hourglass shape. The Hunt 108 and 102 tubular crowquill nibs are too loose in this holder. Why do I have to keep dipping my pointed nib in the ink? 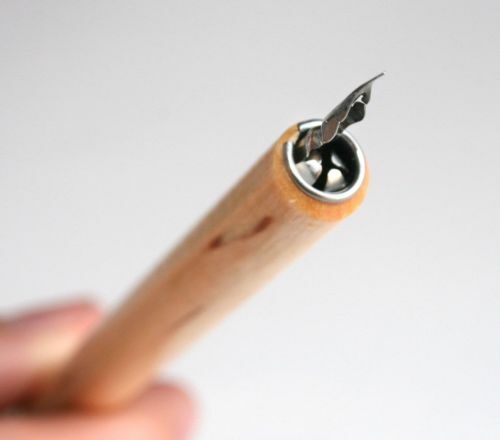 All pointed nibs (pen points) come with a protective coating to keep them from rusting. This coating repels the ink so you don’t get a full load when you dip the point in the ink. You need to remove the coating. The easiest method is to put some saliva on your finger and rub it on the pen point and wipe it dry. (Some points need to be handled with care – they may be easily damaged or have a sharp point.) See if this doesn’t allow you to write a few more strokes before you have to dip again. Many of our customers have had great success switching to the Nikko G and the Blackwell holder. There are four factors here: 1. The sharpness of the pen nib. 2. The roughness of the paper. 3. The angle of the pen nib to the paper. 4. The pressure on the upstroke. To decrease the catch-and-splatter problem on the up stroke, you can use a less sharp nib, write on smoother paper, decrease the angle of the pen to the paper, or use less pressure on your upstroke. 1. Less Sharp nib: The Hunt 101 (N77) and Gillott 303 (N72) are great nibs for copperplate, but they are sharp and tend to catch on the up stroke. The Nikko G (N113) is perhaps our smoothest writing nib. On smooth paper and with a light touch Hunt 99(N88), Gillott 170(N71), and Brause 66EF (N70) will work well. 3. Angle of pen nib to the paper. If you are using the Speedball Plastic Holder, a different holder will make a big difference. The Blackwell Holder (Plastic & Wood) are made so that the pen nib is at a shallower angle to the paper and your up-strokes are less likely to catch. Holders with a metal flange (Century(H51/52), Zanerian(H59)) can be adjusted with needle nose pliers for the same result. Our Blue and Red Oblique holders are already adjusted. 4. Less Pressure on the upstroke. This, of course, is easier said than done. However, it is very possible that if you change one or more of the first three, the problem will be largely solved. I have problems with occasional “oily” places on Pergamenata that repel the paint (Winsor & Newton gouache) - even when I use a guard sheet (glassine) and cotton gloves. Is this common? “Try using “quilter’s gloves” which I think are made by Clover. They come 2 sets to a package and are like archival cotton gloves that curators wear. I cut the fingers off the thumb, forefinger and middle fingers to hold my pen, and leave them on the pinky and 2nd finger as those are what rests on my parchment, which can have the same issues with oil spots. If I used fingerless gloves, I'd still have oil spots because of those fingers hitting the surface." What instruction do you recommend for using a ruling pen for lettering/calligraphy? Letter Arts Review 13.2 (LR13-2, $12.50) has an extensive article by Paul Shaw, “Demystifying the Ruling Pen,” on the history of the use of the ruling pen for lettering, the types of ruling pens used, and a presentation of the work of master scribes work using the tool. Other articles are on manuscript books by William Morris, a 13th century Book of Hours, Brick Carving by Richard Kindersley, and Sheila Waters on Uncial and Half Uncial. Bound & Lettered 5.2 (BL5.2, $8.50) has a five-page article Using Pens with contributions by Glen Epstein, Jim Chin and Kate McKulla which includes examples and an exemplar alphabet with ductus. Sepia is both a color (hue) and a name of a pigment. The color is a brown. The pigment is prepared from the ink, or black secretion, of the sepia, or cuttlefish. It is treated with caustic potash for a rich brown color (Webster's Revised Unabridged Dictionary via dictionary.com). Modern Sepia paints and inks do not use the sepia pigment. For example, Winsor Newton gouache uses Synthetic iron oxide and Calcined natural iron oxide. I'm not sure if I want Speedball B or Speedball C nibs. Do you have any information about those nibs, and the different sizes of each nib? Is there a chart or table that shows the actual diameter of the various bookbinding thread sizes? We have an informational chart comparing our thread sizes to our needle sizes, plus a helpful picture showing the sizes. What is the difference between one of your current nibs and a vintage nib? For some of our current nibs, there is stock of vintage nibs available. The vintage nibs will have several advantages. 1. The quality control on the vintage nibs will much better. You nibs will be more precisely made and you won’t get defective nibs, or not nearly as many. 2. Vintage nibs can be sharper, but write smoother, can be more responsive, and can flex better. Vintage nibs can be more expensive than currently made nibs, but they can a better value. 3. Simply put, vintage nibs are better made and out of superior materials. They are worth trying. You may or may not find that the difference between vintage and current nibs is important to you. How do I use walnut ink crystals to make walnut ink? Dissolve 1 teaspoon of the crystals into ½ cup of distilled water. Wait for 25-35 minutes and this powder produces a lightfast walnut ink. Dilute as needed for lighter shades. Preparing your Winson & Newton 995 Brush for lettering. View this video by John Stevens. Inscribing bound books is one of the trickiest of commissions. I have inscribed many Bibles of varying paper qualities with varying success. Here are two tricks - in addition to testing the fluid in the back of the book. 1) Any nib with gouache is a safer bet than ink, especially as regards to bleeding/feathering. Ground stick ink is a safer bet than bottled ink. Fountain pen ink is almost certainly a disaster. 2) Place the box in which the book was packaged (or something of a similar height)to the side of the book for your hand to rest upon as it moves across the page. Otherwise the tendency is for your hand to "fall off" the book's edge as you are writing. I find that Ziller Glossy Black ink or a Japanese bottled Sumi ink often work, although the dry-time may be challenging to gauge. Work slowly and breathe deeply. – E. S.
If the book is made in signatures, there may be a center sheet of one of the signatures that you can gently cut out. That will give you paper to test inks and such. - Liz Simmonds, North Carolina. Here are the results of my tests. The Zebra G Nib is similar in size and shape to the Nikko G Nib. - The Zebra G Nib will fit in oblique holders that are adjustable, such as the Blackwell Oblique Holders (H50 & H61). - It will fit in oblique pen holders that have been adjusted for the Nikko G , such as the Ziller Grey Plastic Holder (H48 NIKK). - You can adjust the flange on other holders such as the Century Oblique Holders (H51 & H52) to accommodate the Zebra G Nib. - The Zebra G Nib was too loose in the black plastic Speedball Holder (H69). This was a surprise because the Nikko G works in this holder. - However, the nib works in the Sapphire and Garnet Speedball Colored Holders (H65). - The Zebra G nib fit in all the Pen Holders with the metal ring and prongs. You must have one edge of the nib in the gap of the ring. - The Zebra G nib works in the Century Turned Wood Holders (H79, H81). It looks like it won’t, but the nib slides right in! The nib also works in the all-wood Brause Double Pen Holder (H32). The Zebra G does not work in the Speedball/Hunt and Gillott pen holders that are made for the circular crowqill nibs or the smaller nibs. -- Rich Mungall, Ziller Inks. Do you have any hints for the Ziller Classic Glossy Black Powdered Ink? --If you let the ink sit for 6 or 7 days, it will be more glossy. --If the ink is not glossy enough (because you added too much water), leave the bottle open. As the ink evaporates, it will become more glossy. --If you refill your nib more frequently, you will get better gloss. The last strokes out of a dip pen are not as glossy as the first.